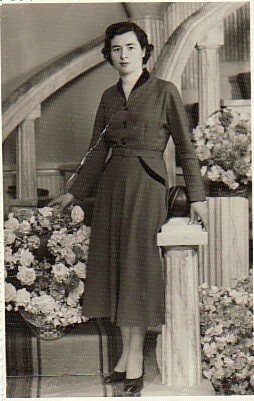 Above Right: On her wedding day. 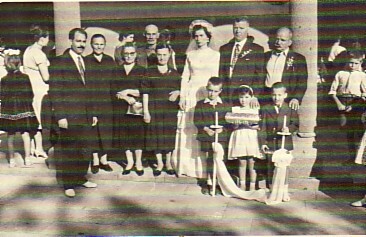 L-R: Efstratios, my mother, Meropy, my sister-in-law, Evridiki, my father-in-law, Georgios, my sister-in-law, Marianthi; myself, her husband, Ioannis and Theophanellis (Marianthi' husband). The children are: unknown, Egli and Socrates. 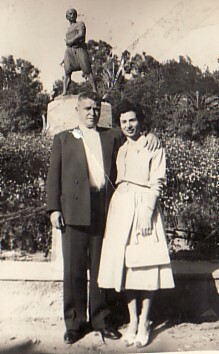 Above: With her husband, Ioannis, in Chios. 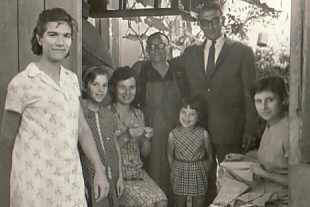 Above Right: With her daughters, Meropy, and Evridiki, and neighbours. Above: At my niece Meropy's birthday, with my extended family. 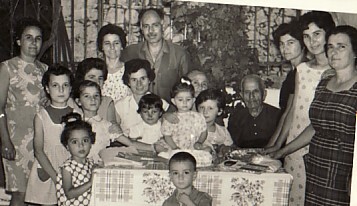 I am centre left, holding me daughter, Meropy, fourth from the left is my daughter, Evridiki. Above Right: Family and Neighbours. 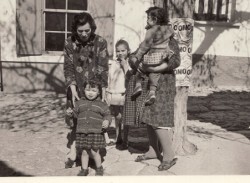 L-R: my sister, Terpsithea, Vaso Psarrou, my niece, Rena, myself, my daughter, Meropy and Annoula Vouvouli. Above: Pericles Koulmandas (from Australia) visiting our home. 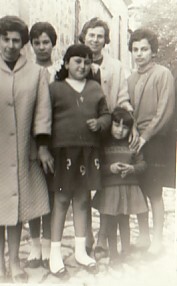 L-R: Maria Persinou, my daughter, Evridiki, myself, my mother, Meropy, my daughter, Meropy, Pericles Koulmandas and Annoula Kalatzouda.